Another New Comic Book Day has arrived and this week there tons of comics I can’t wait to pick up and read through. This is my suggested new comic book pull list for October 10, 2018. We get a The Walking Dead anniversary edition, Catwoman, and the long awaited Spider-Geddon. I am pretty excited for these and look forward to curling up with them this week! Amazing Spider-Man #7: This series has been one of my favorites in Spidey history! It kicked off with a bang, and keeps getting better and better. Avengers #9: I am LOVING this reboot of Avengers. Infinity Wars #4 (of 6): This crossover has me like WOAH! I am really digging the story line – and the art is AMAZING. 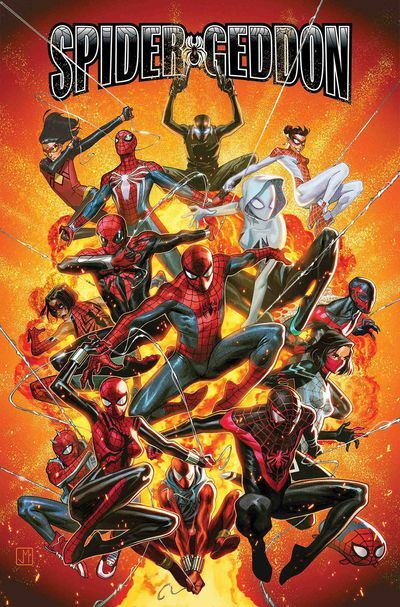 Spider-Geddon #1 (of 5): I am really hoping this one will be great! What If? Punisher #1: Who doesn’t love a good What If? X-Men Black Mojo #1: I am a villains girl so you know I am looking forward to this! Catwoman #4: Did you know I own every Catwoman ever printed? I kind of adore her. She is my next comic book tattoo actually. If I could only find the time. Titans #27: Because of the new show coming out, I am really excited to pick this up! Don’t miss my live New Comic Book Day chats over on YouTube to find out what books I am loving and not loving. This is something I do weekly, on Wednesdays at 1:00 p.m. EST and I look forward to having you join me!